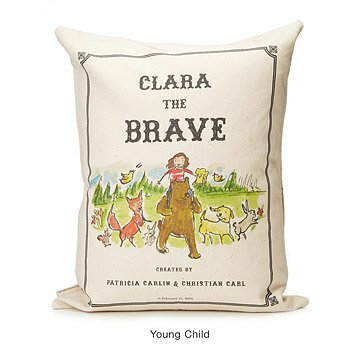 This personalized pillow is a tribute to your favorite brave little person. Cast your favorite little person as a fearless literary figure--whether a newborn making a debut or a young child in the first few pages of his or her heroic tale--with this delightfully personalized pillow, featuring custom, storybook-inspired illustrations on each side and your custom rave "review." For newborns, it's an imaginative antidote to ordinary birth announcements; for young children, it commemorates the magical story of early childhood. For all, it's a soft, safe, and huggable tribute to each child's precious individuality. The charming illustrations by Patricia Carlin evoke timeless storybook classics, creating a unique and memorable custom pillow that will transition from nursery to bedroom to grown-up keepsake. For more storybook titles, check out our Personalized Storybook Pillow - Amazing, Personalized Storybook Pillow - Adventure, and Personalized Storybook Pillow - Legend. I purchased this with a couple of friends as a christening gift and couldn't be happier. My friend is thrilled with it, it's so creative and unique, unlike the typical christening and baby gifts. The illustrations are so cute, such a wonderful idea. Highly recommend. I would buy this product again -- and I have! I have purchased at least three of these pillows for friends that have recently given birth--it's my go-to "congrats on your baby" gift. It's a truly special way to commemorate baby's welcome into the world since you can customize it with the baby and parents' names, birth places and other comments. Everyone who receives it absolutely loves it! I ordered this for a best friend's baby's first birthday, I was immediately attracted to how one-of-a-kind it is! Initially I was wondering if the animals could be personalized as well, even for an additional fee. Unfortunately after asking customer support, I learned that they could not, but the child can be personalized and that was enough for me. It was a smooth process - I ordered the item, and shortly thereafter received a proof to make sure the colors were right. I received it a few weeks ago, and it's exactly what I expected - soft and beautiful, it's going to make a great addition to his room. Can't wait to give the gift! Adorable, sweet gift for baby or young child. Great for a lover of books too! After two tries regarding what was to be written on the pillow, you still couldn't get it right. Very disappointing.